The Minnesota "drought flood" | Watts Up With That? Much as with the UK – where their “drought” is demonstrated by severe flooding … in Minnesota it is much the same. Most of the “Moderate to Severe Long Term drought area has seen 200% to 600% of “normal” rainfall over last 30 days. An interesting – to me – observation is the precip pattern from Southern to Northern MN and the Eastern Dakotas almost exctly matches the normal precip pattern – just in much higher numbers of total precip. CAGW proponents will try to tell us this is because of all the extra water vapor due to warmer temps – which would of course be pretty ridiculous because then we wouldn’t have had drought the last appx 1 year with extreme precip and snow a year earlier. What it shows – to me as a layman – again, is that it is weather patterns, both longer term but also the minutia of each days weather – where the fronts are, what the winds are doing, how the jet stream is flowing, where the moisture is coming, what the temp gradients are etc etc that are what is determining the weather – not some ridiculous theory based on computer models with garbage inputs. Heck – even the SHORT TERM weather models – looking 7 days out or less – cannot usually agree. My anecdotal experience form occasional looks is that the European ECMWF model is usually more accurate in my area than the US models. Monsoon rains and yet we are in moderate to severe drought. But it must just be a few recent extreme events like last 24 hours that caused this – right? Well, you know, if the models say it’s so, then it must be so – regardless of what is actually happening! wouldn’t the extra water vapor just become more free oxygen when exposed to ultraviolet light. Why does the CO2 argument continue to make the media rounds without being challenged by the physics and chemistry of warm weather processes that are composing our atmosphere with a 78% concentration of N2 and a 21% concentration of O2. If CO2 caused warming then wouldn’t it entail that more N2 and O2 would be produced at such significantly greater rates (that creating 78%/&21%concentrations that the concentration of CO2 must decline under warming conditions. Why do temperatures on earth warm…Atmospheric heights increase and thus Earth’s Radiative Budget Equation loses effect because atmospheric pressure is less. Why does the atmosphere increase in height? 1) Albedo 2) Warmer oceans 3) Magnetic Field disruption by Solar Activity- Magnetosphere density decreases and Ionosphere expands. b) Oceans will release CO2 at enhanced rates until the temperature threshold for CO2 absorption is reached. c) CO2 increases in concentration when the atmosphere and its boundary layers shrink and natural processes that effect concentration of Nitrogen and Oxygen are not enhanced by warming. d)Terraforming deserts will lower atmospheric heights which will increase precipitation and lower temperatures (think rainforests). Its the same in Australia. It took 2 years of far above average rainfall and multiple floods for the government to declare the drought over. Farmers are a powerful lobby group. this reminds me of the articles coming from the UK insisting that their hosepipe ban must remain due to the extreme drought conditions despite the wettest April in almost 100 years. Don’t they lose some credibility when people simply look outside? o.k. now try to start thinking. Similar to events here in parts of England. Hosepipe bans are in force & it’s done nothing but rain for a month! One valid point, was that we’ve had 18 months or so, of below-average rainfall, then a month of double the average, still leaving us 17″ down, so ground water & aquifer levels are still below where they should be. Now back to reality. When are these loons going to realise that climate change / weather changes happen and is happening – just not always in one direction, as it has always done. At any one time there will be a part of the world in drought or flood and there is now observable evidence that it’s caused by man’s co2. Having worked in a research environment I know Humpty Dumpty’s words are literally true. A educated person might innocently think a pediatric patient is a child. In several projects we had “pediatric” patients in their early twenties because the term was (re-)defined to mean a patient having had heart surgery as an infant. As long as you know what meaning has been chosen it all makes sense. The problem in this story and in the UK is only very poor communication. Same in france. Extreme drought demonstrated by incessant rain. Temperatures in normal range for the season. Al the while we were bombarded with serious looking guys (usually bearded in sweaters) telling how awful the drought was. Excessive drainage of groundwater over the years due to corn crop caused the watertable to drop. Experts of all types are getting caught with their nonexistent trousers down. This is similar to the experts in the equally murderous pseudoscience of “economics”. They continue to tell us that we are in a “recovery”, and we need to follow their suicidal orders perfectly or else we will end up in a “double-dip recession”. Anyone who observes REALITY knows that we are in a continuous recession with no hope of exit as long as the transparently false theories of “economists” are in charge. UK rainfall patterns are highly variable – around 33% each side of average. The low period was not out of character. You handle variation in rainfall by storing water in the wet periods to use in the dry ones. For the South East, about 70% of storage is in underground aquifers, which are hard to expand. That leaves surface reservoirs to take up the slack. We have had an 11% increase in population in the SE of the UK, and water companies have proposed 5 new reservoirs, and extensions to 3 more, to cope with this. See their 2004 plans. ALL these reservoir works have been halted by government intervention, because it is government policy that we should use 20% less water (see the ‘Water Futures’ policy document (2008)). There is no reason I can see to plan to cut down on water usage. It is not a scarce resource – it just passes through us in a cycle. We can store as much as we want. But it is government policy NOT to provide enough infrastructure to service demand. Why – I have no idea. There is no environmental reason not to, and the water companies want to…. So far 4.23 inches of rain has been measured at the official site, Minneapolis-St. Paul International Airport. That’s an inch more than the average rainfall for an entire month of May. So lawns are growing like crazy. … So, your point is what, exactly? The question is, can you, as this post has not been authored by Anthony. Last year in North-Western Iowa (lower part of the drought zone) we went from July through November with very little rain. It was arguably a drought and more than a little worrisome because of the effect on corn/bean yields. This year’s been pretty good for rain so far. The fields are certainly wet right now and the corn is up (if anyone was wondering) because the farmers were able to get into the fields weeks early due to the warm days. I’d chalk it up to weather and not worry too much about it. Before mankind started to affect the climate droughts were caused by lack of water. Nowadays they can be caused by increasing CO2 levels. Consequently we sometimes have old style droughts where everything is too dry but occasionally we get new style droughts where everything is too wet. Is that clear? The US Drought Monitor map also shows southern SC (where I live and work) to be under extreme to exceptional drought. Horse Poop! In late winter and early spring, we did have lower than average rainfall but nothing that could be called a drought. There was no stress to vegetation, controlled burns were allowed the entire time, and recent rains have returned groundwater, rivers, and lakes back to nearly normal levels. Despite this “extreme climate change”, the birds, bugs, bunnies, and all the rest of us are just fine, thanks. When a government agency won’t even report rainfall accurately in order to push a political agenda, it’s time to clean house! Fire these liars at NOAA and NASA. I couldn’t agree more. There is no ‘drought’. There IS a severe ‘water shortage’ due to crass mismanagement and government interference. Cutting dividends and exorbitant salaries and bonuses to fix the leaks would take care of the problem. According to what I read at UKReferendum, leakage alone empties the equivalent of the whole amount of water available every 700 days. Unbelievable! nope as MFKBoulder is just another drive-by wanna-be who knows that they are losing people to the truth and are now so upset that rational thought and things like looking at more than just the headline are going out the window. I thought the drought monitor was only updated every 2 weeks? I would expect the drought monitor to show additional relief for minnesota at the next update. You should have shown the evolution of the drought monitor map to see if it was changing with the rainfall. Drought Buster: Wettest May in 8 years; Huge sunspot may trigger auroras. Somebody flipped the rainfall switch “on” this month. 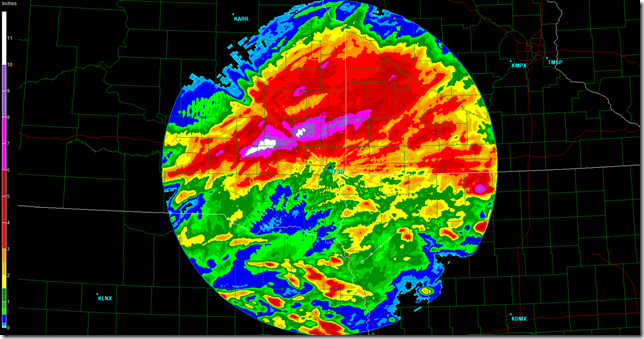 In the past week, waves of torrential rains have dumped anywhere from 2″ to 7″+ in southern Minnesota in a band from near Sioux Falls to Redwood Falls, Mankato and right into the Twin Cities metro. Check out the impressive rainfall totals map below for the past week from the Twin Cities NWS. I’ve been reading the Drought Monitor site for some time, and the authors do seem to have an alarmist bend in their narratives (what a surprise), but seem to follow some pretty robust methods. But I agree, those amounts of rain should have eliminated drought in southern MN. The declaring of drought conditions in the UK, USA, Australia…. has nothing what ever to do with weather or climate. It is all about the United Nations latest grab for control – WATER. This is the focus of chapter 18 of Agenda 21. Further recommendations to support implementation of chapter 18 were taken by the Commission on Sustainable Development at its second (1994) and sixth (1998) sessions; by the United Nations General Assembly at its nineteenth Special Session to review the implementation of Agenda 21 (1997) and by the World Summit on Sustainable Development (2002) through its Plan of Implementation. And the World Trade Organization is right behind the United Nations. Do not forget Pascal Lamy’s article Of What Use is Global Governance? …Climate change is also on the agenda of this meeting, and rightly so. It will have many impacts on agriculture, one of which is the potentially greater scarcity of water. In 2006, the UNDP’s Human Development Report drew our attention to the water-saving potential of international trade. The “virtual trade in water” — as the UNDP called it — could lead to reduced water consumption in importing countries. It gave the powerful example of Egypt. If Egypt were to seek self-sufficiency in agriculture, it would have to import water! Similarly, were Northern countries to aim for greater agricultural production in greenhouses, their carbon footprint would very soon come to complicate the already complex climate change negotiations…..
WHAT? The WTO is OPPOSED to the use of greenhouse in the north because it might complicate their transfer of assets via carbon credits??? And what the heck is “virtual trade in water”??? Another misleading map is the US Drought Monitor. Look at the region of east central WA & OR, colored yellow for “Abnormally Dry.” Nonsense. This region receives on the order of 6-10″ of precipitation – PER YEAR – almost all of it from November to May. There is nothing abnormal about 2012. The long term Palmer Index shows no drought in southern Minnesota. I live in southern Minnesota. The drought was never really severe. There was a lack of rain that started late last summer. For the most part it had little influence on the crops. During the winter in Minnesota the ground freezes. This means whatever precipitation falls (usually snow) just sits there until the spring thaw when the majority of it just washes away. That means for 6 months the drought is inconsequential. We had a dry winter but it really didn’t matter. In addition, the rains of April were the slow type where the precipitation soaks into the ground. Very little run-off. Even though it wasn’t a lot of rain, most of it did soak in. Everything was very green and no one was watering their lawns. The farmers were happy because they could easily get their fields prepared for this years crops. Some even planted 2-3 weeks early. The net … we really weren’t in a serious drought at all even before the most recent rains. Interestingly, some of these recent rains were real heavy and a lot of water did run-off. So, if we had been in a real drought these rains wouldn’t have been as good as the numbers indicate. Just noting that increasing water vapour is a myth. It is projected by the climate models and shown in some papers where they do data selection starting a low point and ending at a high point, and the alarmists like to keep talking about it. But there is no increase in water vapour levels since the late 1940s. (It might have been lower in the cool early 1900s but the data is just a guess here). Last month, the global water vapour level was 0.16 mms/m2 or 0.7% above average and the Tropical levels fell below average (which would not be expected given we are leaving a La Nina and moving toward an El Nino – the ENSO really controls the overall level of water vapour given it is by far the biggest weather phenomenon influencing it). The climate models have water vapour at about 4.5% above average right now so they are far off. Minnesoata Public Radio is left of left on most issues. Gail, the drought in Eastern Australia was absolutely genuine – I lived through it. The point is, such droughts are part of the normal cycle of climate in this country, and indeed there have been worse ones in the 200 odd years Europeans have lived here. And as in the UK, the green agenda has prevented construction of any significant water storage capacity for the last 30 years, while population has increased significantly. Actually, the current situation where there are no drought declared areas here is very unusual. The normal state of affairs is that there are regional droughts pretty much all the time. However, climate alarmists seized on the last widespread drought and claimed it was the new normal. The fact that it broke so dramatically has greatly damaged their cause in public perception. It is vital in understanding these fears – and thus, the focus, funding, and research and attention being paid to (future) droughts – that you (the readers) see that “Catastrophic Anthropogenic Global Warming” is viewed by the CAGW community as creating “Sahara” levels of heat. In East Anglia. In France. In mid-Siberia. In the upper MidWest of the US and in upstate NY. Now, the mere facts that the number of hurricanes are NOT increasing, that the intensity of hurricanes is not increasing, and that worldwide average temperatures have been steady for 15 years now (and thus storm intensity by their logic SHOULD BE constant since supposedly storm intensity and numbers are proportional to temperature) is meaningless. They KNOW that hurricanes are increasing because “The world is becoming more tropical and the tropics breed hurricanes”, and so can be told that by their “impartial” (but socialist) ABCNNBBCBS media. So, since they have no idea – because they have never been told that today’s totally propagandized GLOBAL WARMING, GLOBAL WARMING, GLOBAL WARMING, GLOBAL WARMING, “ headline-hyped news media-promoted temperatures are only 1/10 of one degree higher than 1970’s “we are heading for an Ice Age” temperatures – today’s population and today’s civic leaders really do picture West Australia and East Anglia as the next Sahara Desert or Upper Michigan as drought-stricken rocky wastelands. And thus, (in their addled minds filled to overflowing with propaganda) ANYTHING that these “civic leaders” can do to prevent drought or reduce water use by government force and government programs “MUST BE DONE IMMEDIATELY” to prevent utter catastrophe in the future. In my experience, the drought monitor overstates drought and they have done so since their formation. I’ve suspect that more drought = more interest in what they do. A decimal error – annual rainfall on the Oregon coast is 60 inches to 100 inches per year. Thanks Richard. I always enjoy hearing from folks who actually LIVE in the “affect” areas. Do you live in Minnesota, MFKBoulder?? Oops. Should be “affected areas…”. As Mike86 said above, much of Iowa went from July through November with very little rain, though I would place it more like June through February. While the Missouri River was flooding, a small town i work with had the driest ground conditions anyone could remember since the 1970’s and it is 4 miles from the Missouri River. We have had some good rains this spring, but the real question is how much of that made it into the ground, and how much ran off? Significant amounts of that rain came in very intense bursts that have a tendency to run off, rather than infiltrate. If you get four inches of rain but 3 inches runs off, the drought is not broken. What matters are the soil moisture conditions, rainfall is only an indirect indicator of whether there is enough water. Last I heard, soil moisture was ok but not back to average. I live in Chicago area. It was dry in the midwest until I started my nonstop travel schedule a few weeks ago–causation or correlation? You decide. Having lived in California for a good long part of my life, I’ve gotten to watch the ‘evolution’ of ‘drought’. In ’75-’76 I decided to learn to ski. Little patches of snow connected by paths of hay. Bad choice… That is what pretty much everyone agreed was a drought. Then we started having droughts even when it was raining. The ‘answer’ is, IMHO, that drought is now defined as any time you have below mathematical average rainfall AND the exit only comes when that deficit has been replenished. Think about that for a minute and you realize that about 1/2 the time you will be in a “drought” as 1/2 the time precipitation MUST be average or below; PLUS you will be in drought during times of surplus until the deficit is repaid. Make the window over which that “deficit” is carried large enough and you will be in “drought” most of the time. Simply because it takes ALL of the periods of surplus added to the periods of deficit to reach the “average”. The net result in California is that we are in “drought” about 3/4 of the time as a couple of wet years need to pass before the “deficit” is made up. IMHO, it’s largely a statistical gimmick used to attempt control of behaviour and restrict growth. There was a time when climate was defined by the nature of a place. Deserts were where more water evaporated than precipitated. Tundra was where permafrost prevents growth of trees. Alpine meant high cold mountains. Etc. Basically, real Climate depends on: Latitude, Elevation, Land Form, and Distance from water. Those things do change, but only on geologic time scales. Thousands to millions of years. It is a deception to call a “30 year average of weather” to be “climate”, yet that is what was done in “Climate Science”. That kind of definitional game is rampant in the world of Post Normal science. The “climate” in “climate change” isn’t Climate, it is the 30 year average of weather. Similarly, the drought in our modern droughts is not a real drouth. (The old spelling / term…) Rather it is a statistical artifact of a bad definition that will result in calling a drought even when rainfall is normal, keeping it in place until the long term average exceeds normal and “breaks the drought”. If your ‘drought window’ is a decade, one dry year followed by 9 absolutely average years would give 10 drought years as you still had a ‘deficit’ in the long term average. As for “why”: Near as I can tell it is exactly in conformance with the UN Agenda 21 attempt to implement central planning and control on a global basis. This method works via a recruitment of true believers into “Local 21” chapters and promotion via the Green Agenda groups. It is not a hypothetical, and unlike many UN groups that are largely impotent, it is active and growing rabidly (and expects to tack on a few $Hundred Billion of taxes and fees on “developed nations”). Frankly, I thought the Agenda 21 stuff was “crazy talk”, then I looked into it and found it operating in my home town and nearby areas. It is real, pernicious, and evil. The present buzz word is “Sustainable”. The propaganda to push it is strong indeed (who would not want things to be ‘sustainable’?…) The reality is that “sustainable development” has nothing to do with what we would think of as sustainable development. It is about removal of individual rights and freedoms (and blocking development). Yes, there is evidence in the FOIA 2011 emails of The Crew coordinating with Agenda 21 block captains. loads of “greens” and folks seeking power over others. Basically, as important as the AGW battle might be, it is but one small part of a more global effort to disenfranchise the Common Citizen and centralize power and control beyond their reach. The UN Website on Agenda 21 lays it all out pretty clearly (link in the article) and it includes such things as moving people off of small farms and into high rise cities. That is why there is an attack on family farms from the USA to Australia. It didn’t “just happen”. So watch out for “Definition Games”. It is one of the preferred “tricks”. They will be showing up in anything to do with land use, resources, “climate”, and population control. I think a lot of this can be put down to the good (or not so) old Precautionary Principle! We apply it almost to everything here in the PDREU state of UK! They shift the goal posts regularly by redefining drought conditions, then applying banns! As pointed out by EU Referendum’ Richard North, the amount of water shortfall by Thames Water is virtually equalt to the losses through leakage in the didstribution pipework. Back in the early days of privatisation of the water companies under Margret Thatcher, the British people were promised that the the private water companies would be obliged to tackle the crumbling infraastructure with a rapid investment to plug & repair leaks. The ombudsman, Offwat, has failed to ensure that this is done! Also the previous Socialist Guvment deliberately ignored engineering & scientific advice about low storage capacity in the South-East of the country, which also compounds the issues. There is no global warming cause to this drought at all, but is largely manmade through arrogance & stupidity- I dare say the minister concerned has been promoted into the House of Lords usual! Living here in N MN, we did have a warm, mostly dry winter. Leap day weather front brought us good snow, along with a Lake streamer a couple days later. That helped. Warm(downright hot at times), and dry March, but April went cool and wet, and continues to be wet with some cool days mixed in. Looking for summer to be seasonable and wet. Lots of storms is my forecast. Thinking Memorial weekend is fair to start, then over to rain and thunder to end. 4th of July looking wet around here, as well, but that day is in the middle of the week. Most folks working, if you have a job. “Some commentators and politicians, such as Alberta Wildrose Leader Danielle Smith, say they are not convinced humans are contributing to the warming trend. But as far as precipitation is concerned, we have had more in April, (58 mm) and much of it snow, than in January, February and March combined (46 mm). BTW – my BMI is close to 25 (on the edge of “overweight”), and I’ll be running my 11th marathon in two weeks. Meanwhile, anorexic fashion models who don’t eat anything are considered healthy …WUWT? Indeed. In the short term, of course, there is a ‘water shortage’ in the system when there is a leak, but none of the water is ‘wasted’. Unquestionably, SOMETHING is being wasted, and it turns out not to be water, but rather INFRASTRUCTURE CAPABILITY. I think the map of “percent of normal precipitation” is highly deceptive and I do not recommend its use. The if “normal” is dry, it still shows up green and blue without breaking any drought. If normal is dry, then being short only 1/2 an inch of precip can be colored brick red. Much better is to plot the “Departure from Normal” in absolute inches. And compare it to Normal. I used to think that Agenda 21 was a paranoid fantasy of militia types . Until I looked into it . Unfortunately , most people don’t realize what it’s all about and , apparently , aren’t interested in finding out . After all , as you say in your blog , sustainability sounds so good and reasonable . Some folks are beginning to wisen up , though . There is a major mountain range between east central and coastal WA & OR so the error here is about 200 miles +/- about 75 miles. Round numbers, no decimals. “The French presidential campaign had the merits of putting the urgency of growth on the agenda,” Hollande, set to take office May 15, said in a Slate.fr interview. He said France will cease being part of a “duopoly” with Germany that imposes austerity on Europe. Googling the words “austerity” and “sustainability” I found this gem from UN EcoSoc Mar 13, 2012 Qatar. Friends, just follow the money! I’m always amused by the emphasis placed on “abnormal” weather. I’m strictly an amateur devotee of the weather although I’ve been fairly obsessive about my devotion, at least for my local environs. In over six decades of monitoring the local happenings the weather event that has been almost the most rare, exceeded only by tornadoes which we’ve never had one in my lifetime or long before, is the “normal day” ie a day when the actual high, low, and precipitation match exactly the long term averages. I can remember only one year when it occurred twice and many years where it never happened at all. Although some stretches run closer to “normal” and others depart from it “extremely” weather that is actually “normal’ is as scarce as hens teeth, at least here in Southern MN. I don’t possess the skills or patience to attempt it myself, but perhaps one of the dedicated number crunchers out there could do an analysis to quantify exactly how common “normal” conditions are on a national or global basis. It wouldn’t add much to human knowledge but would at least offer the opportunity to counter the flood of PR propaganda about how “extreme” the climate is becoming. The drought monitor is valid last Tuesday. None of the heavy rain over the past week would have been included. Hope this clears things up. There are actually two mountain ranges that intercept moisture flowing eastward from the Pacific. The Coast Range intercepts first, resulting in coastal rainfall exceeding 100 inches per year. The Willamette Valley is in the rain shadow, getting substantially less rainfall but still enough for both major universities to have mascots with webbed feet. The Cascade Range intercepts most of the remaining moisture, leaving the eastern half of the state with rainfall in the 6 to 10 inches of rainfall that I commented on. Drought is a cumulative shortfall in precipitation. So the critical measures of a drought are how long and how severe. That allows us to quantify the depth of the drought. I do not have the relevant data, but it does not seem impossible that the area has a precipitation deficit that still exceeds the recent heavy rains, so that it may be quite reasonable to claim a drought is still in effect despite these rains. A perfect example of reality aping fiction. George Orwell wrote about doublethink and doublespeak in his book 1984, and everyone thought he was exaggerating. But now doublespeak is an everyday event. In 1984 the Ministry of Truth changes history and broadcasts lies. In 2012, the Ministry of Truth has been replaced by the IPCC. Guess I’m confused why you commented in the first place. The yellow colored area on the map is quite clearly what is known as the “mid-Columbia Basin.” It is an extremely dry place under normal conditions. The US Climate Monitor is calling it a drought area, when these are the normal conditions for this area. My point is that this is bogus. Well aware of the wet Coast Range where, in some areas, annual precip tops 150″. I’ve lived on both sides of the hill, currently in the Willamette Valley, and much prefer the “dry” side with 300 plus sunny days a year and reliable irrigation. Could grow almost anything, except citrus. Drought has never been a cumulative shortfall in precipitation until recently, it has always been a long period with no rain. This can be checked in any english dictionaries and wildlife programmes that use be on air. What next, when it rains it’s flooding? When it snows it’s a blizzard? When it’s windy it’s a hurricane? Look whose running NOAA; It was once a science based bureau but now it’s only a mouthpiece for a federal government that lies to further the climate change agenda. Same goes for the weather channel–Why do you think the WC runs and reruns their weather disaster serials. The public is so stupid they start to believe these disasters are increasing. It’s nothing but pure propaganda. Certainly there are droughts, and a real droughts have consequences; but months ago, the US Drought Monitor lost my respect. Even before latest rainfall, lakes, ponds and marshes had water levels that had not been seen in year. Last week, a neighbor got stuck in his backyard with his lawn mower — the ground was so soaked. Grass, bushes and trees are extremely green. Farmers are harvesting record crops, but U.S. Drought Monitor is telling us that we have severe drought? The drought monitor may be valid in its models, but not in reality. Your comment would be relevant if last week we were truly experiencing a severe drought. But even before this latest rainfall, water levels were fine, crops were growing nicely, and it was difficult to mow lawns due to moisture. Let’s save the term severe drought when there are big issues — such as the 1930s when many prairie lakes in Minnesota dried up. Today, those lakes are full and teeming with fish. Jim … you must have missed my comments at the end … that for the past 7, 14, 30, 60, 90 and 180 periods precip in the area has rum from 125% to 600+% of normal. That would be 6 months. For the past 60 and 90 day periods precip in the area has run from 150% to 300% of normal. Watch closely – as the drought rating moved from Severe Short Term to Severe Long Term drought conditions in April, despite both a nearly 6 month history at that point of above average precip – AND the more current history was showing preip at 200%-400% of normal. Not sure exactly where Jim was getting his numbers from, because until recently much of southeast Minnesota has been 6 to 9 inches below normal since August 1, 2011 (http://climate.umn.edu/doc/journal/drought_2012.htm). Until the recent rains, the heaviest rain fell on February 28th and February 29th and a good majority of that water ended up in the rivers. This drought was definitely affecting the river and stream flows and also the ground water levels. The vegetation was not really affected because the top soils had moisture and it was early in the growing season so water demand was low, but the sub soils were very dry. Many of the caves were starting to dry up. If we would have had any extended dry spell, there were no reserves for the plants to use. Fortunately, over the last two weeks, we have had enough rain to cause some improvements. By the way, I would have termed the droughts in 1930s as extraordinary (D4) than severe (D2) which has a frequency of occurrence about every 5 to 10 years. FYI, we’re not bleeding people when they get sick any more, or using phrenology to diagnose personality traits. We all know what “drought” means. And those of us who are reasonably educated know that droughts move from place to place over time, as do floods. They all happen intermittently. Attempting to prop up the discredited notion that CO2 causes climate change may work at pseudo-science blogs like RealClimate, where they believe in droughtfloods. But not here. 3) it is not dry anymore. Monsoon rains and yet we are in moderate to severe drought. No …. you WERE in a moderate to severe drought up through the end of April. BEFORE the monsoon rains. But it must just be a few recent extreme events like last 24 hours that caused this – right? The first week of May (“past week”) was 3-5″ above normal. If we subtract the 3-5″ during that wet week from the previous data, we see that the rainfall is somewhere around normal going back from the end of April. @tjfolkerts: This is the point I was trying to make. If you subtract the extremely heavy rains last week (which weren’t factored into last week’s drought monitor), there was a rainfall deficit in the area. Temperatures also factor, as well as the lack of prolonged snow cover last winter. Many stream flows were at or near record lows for a time. Agricultural effects from drought are usually not realized until late summer or fall. And as another commenter pointed out, D2 merely means dryness of 1 in 5 to 1 in 10 years. It doesn’t mean lakes must be drying up, trees dying, etc. Precipitation, EXCLUDING APRIL, across the state averaged 118% of normal over the previous 120 days in April, AND April precipitation for first 3 weeks was appx. 110% to 350% of normal across majority of the state. An updated U.S. Drought Monitor depiction will not be released until Thursday, May 10. However recent rains assure that categorical improvements are in order in many Minnesota counties, especially those where last week’s rainfall exceeded the weekly average by two or more inches. Because transpiration (plant water use) is not yet underway on our agricultural landscapes, last week’s rainfall was nearly completely net gain; improving soil moisture supplies, stream flows, and lake and wetland levels. The only sustaining drought impact in southern Minnesota are somewhat low water levels on our larger lakes, especially land-locked basins that are strongly tied to ground water. Isn’t so hard to comprehend. First – it is not a “paper” – it is a layman’s commentary, however one backed by government data. 2nd – as with tjfolkerts you too seem to fail to grasp the reason for the commentary – the details. The May rains are largely irrelevant. Since it appears you dd not read my post immediately above I encourage you to do so now. NOT INCL the MAY rains, precipitation has been above normal for the 30, 60, 90, 120 and 150 day periods prior … during this time of above average rainfall, and when rainfall was further increasing, in mid April the drought indication was increased from “short term severe” to “long term severe”. With precip above average the prior 5 months, and increasing further above average in April’s first 3 weeks, why did the drought classification go from “Short Term Severe” to “Long Term Severe”? Huttner who writes the updraft blog just regurgitates the party line on CAGW. You’ll certainly never see him asking critical questions of the establishment such as the lack of statistical warming over the last 15 years. The really amusing thing is that up until last summer when rainfall really tapered off we had been hearing about how MN was becoming warmer and wetter. A mere 8 months of that pattern turned into “drought” but as Richard M points out that really meant very little to people’s lives except for some snow tourists in the north of the state. Commuting for the rest of us and snow removal budgets certainly benefited. Arguably the precipitation pattern was near ideal for agriculture and first the first time in a couple (few?) years the Red River valley didn’t flood nor did the southwest metro crossings over the Minnesota (Hwy 101 and CR41). Now with most of the spring planting already done and ahead of schedule we’re getting needed rain. Aside from some whiny folks on lake Minnetonka –I weep, truly I do– I think most people are pretty happy with our bout of very minor drought. Long Term Severe means: no problem at the moment; trouble might ahead with the current water withdrawl (and percipitation remains low). AFAIR is the Minnesota groundwater balance goverend by winter percipitation. With “lingering impact of precipitation deficits accrued during the 2010 growing season and spotty rainfall in 2011” there might be long term effects (darinage of aquifers) where the short term conditions turn out to be more “comforatable”. I saw that my crude guess was failry good. oops: should have been “fairly good”. Being ~ 5″ behind average for a long period sounds rather like a mild drought to me. Presumably the south central section was further behind, which would sound like a moderate drought. A slightly wet FEB & APR is hardly enough to make up for a long-term water deficit. My main point is still to wonder what your main point is. The post you link to at the top regarding UK forecasts is noteworthy because they completely mis-forecast the next month. But this is not a thing like that. Based on my formative experience on the wet side of the hill everything else is “below average”. But now I am dealing with annual precipitation in your 6 to 10 inch range. I do understand how the models produce what they produce, but my perception is that the models are in conflict with reality. Even after the heavy rains of early May, the models are saying that Minnesota is abnormally dry to moderate drought. That assessment just does not match what the population is experiencing.